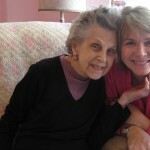 You are here: Home / Blog / Alzheimer's Disease / Old Age or Alzheimer’s Disease? Is Alzheimer’s disease or any dementia part of the normal aging process? In other words, if we live long enough will we get dementia? Are the memory problems we see in an aging person the normal effects of old age or Alzheimer’s? The graph shown here is only meant for illustration. It does not represent real data points or measurements, but shows how dementia causes a marked decline in brain functioning after onset of the disease. The cognitive scale (y-axis) is only a relative measure, and the rates of decline are not actual. The point is, there is normally a slight decline in cognition as we age represented by the gentle slope of the green line in the graph. Hopefully we make up for that decline in the wisdom of our experience. 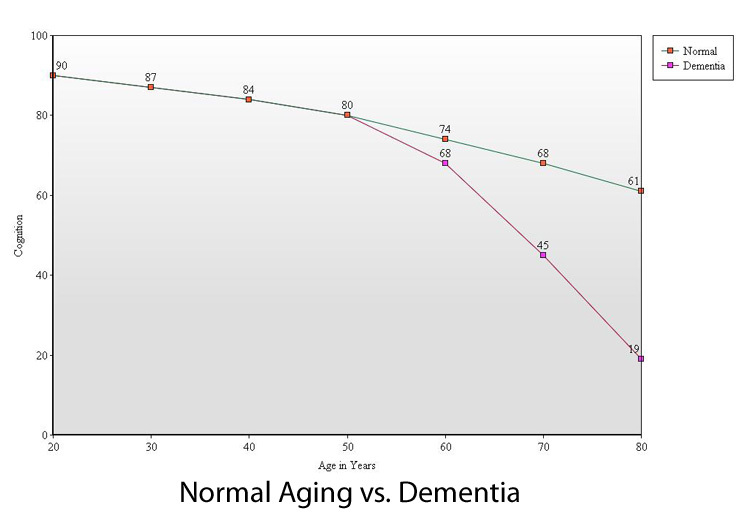 The cognitive decline that is typical of many types of dementia, represented here by the red line, is much more severe, resulting in a much steeper slope. Even the age scale on this graph is somewhat arbitrary, as different types of dementia can begin to affect the brain at different ages. The effects of Alzheimer’s disease usually start to become noticeable at age 65 or 70, but younger onset Alzheimer’s disease can begin as early as thirty years of age. Another way to look at this is that the declining cognitive abilities of a normally aging individual are not very noticeable; first relative to the individual himself, because the decline is gradual, like watching a clock move; second, if we consider the rate of decline relative to others of the same age we don’t notice anything much, since the decline of other “normally aging” individuals is similar. We have to compare change over decades to really notice anything. On the other hand, if we compare the rate of cognitive decline of someone with Alzheimer’s disease and someone who is aging normally, we see a much more radical change over much shorter time intervals, sometimes even months. This is the case if we compare decline to a normal curve, or if we compare it to the history of the individual. At age 50 in this illustration the red (dementia) line breaks away from the green (normal) line, indicating a more rapid than normal rate of cognitive decline. Also, the slope of the red line increases significantly after age 60 relative to the slope of the red line before age 50; that is, the individuals cognitive abilities are declining much more rapidly after age 60 than they were before the age of 50. Compare this to the slope of the green line which increases only slightly with years. So is it old age or Alzheimer’s disease? This is a rather simplified description. The point is that dementia is marked by a fairly rapid and statisticaly significant loss of cognitive ability; whether it is noticed or not, it is safe to say that this decline in cognitive competence including memory, reasoning, and judgment, will always accompany the onset of dementia. There are conditions, however, that can cause a similar deterioration but are not dementia and do not lead to dementia. Most notably, depression and delirium can present with symptoms that are often indistinguishable from dementia symptoms; in fact, there are as many as fifty conditions that can mimic dementia. These conditions need to be ruled out before a definitive diagnosis is made. Inability to perform instrumental and basic activities of daily living. Inappropriate behavior that is not in line with the behavioral history of the individual. Psychiatric anomalies including delusions and hallucinations. Bernice’s severe auditory hallucinations were one of the first things things that really concerned us about her and led eventually to medical intervention. Loss of physical functions; incontinence, problems swallowing, lack of smell, loss of mobility and balance. Most of the physical symptoms appear later in the progression of the disease and so aren’t necessarily diagnostic, since the impairment will be minor in the early stages of the disease. Read more about early symptoms of Alzheimer’s disease. Any of these behaviors and symptoms could manifest for a variety of reasons not related to dementia, but if two or more are recognized, if they persist, and your notice them worsening, dementia is a likely culprit. The person to whom this is happening won’t necessarily recognize that it is happening. Make an appointment for your loved one to see his or her doctor, and go along. † Thanks to Dr. Mathew Summers, research fellow with the Wicking Center of the University of Tasmania for the concept for this graph.